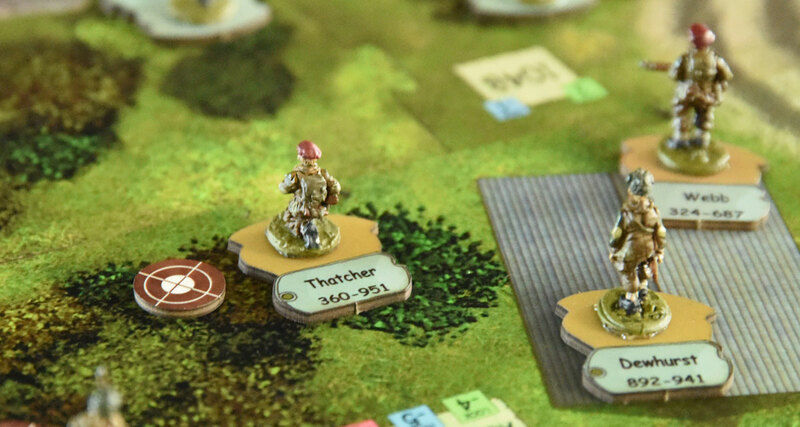 Sergeants Miniatures Game is a unique gaming experience with simple, elegant mechanics that make it easy to get to the fun quickly. It has board game type elements, but it is also card-driven. 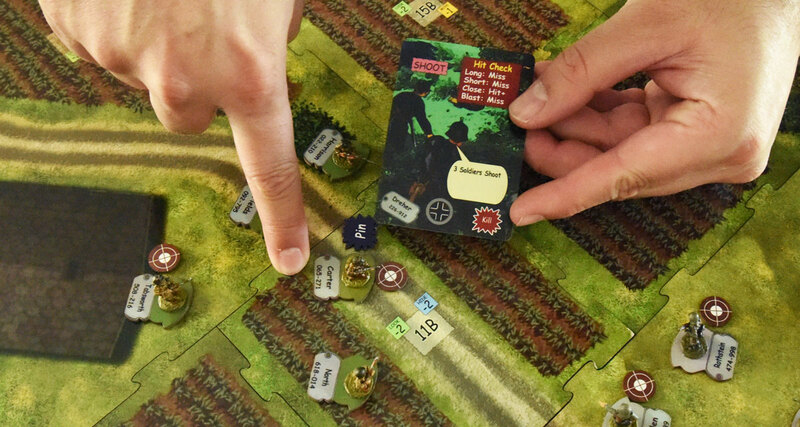 Cards make the action phases variable (and provide random surprise events), while other cards in each player’s hand offer the challenges of making the best choices and their results. So, a game of SMG is never routine and provides a new experience each time you play it. 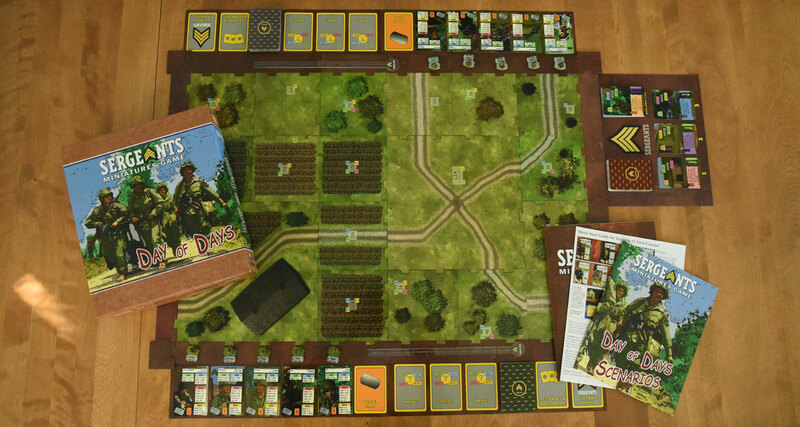 The entire game centers around four different kinds of actions – Look, Hide, Move, and Shoot. 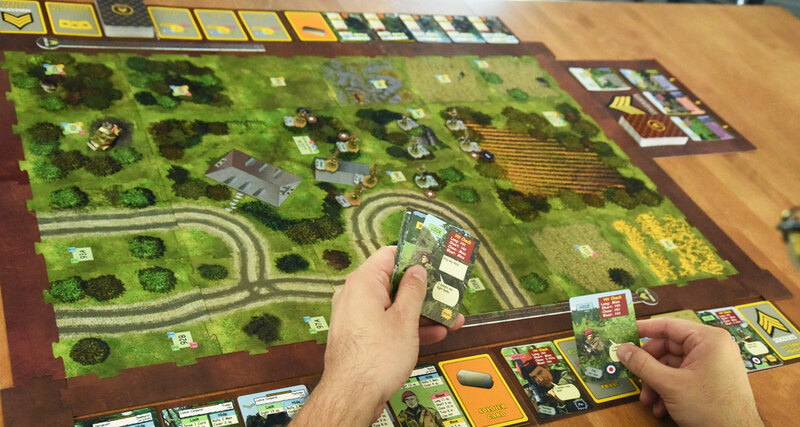 These actions are built directly into the play decks, map board, and story deck. Best of all, you don’t have to look up anything in charts, because those four actions appear whenever and wherever they are needed. 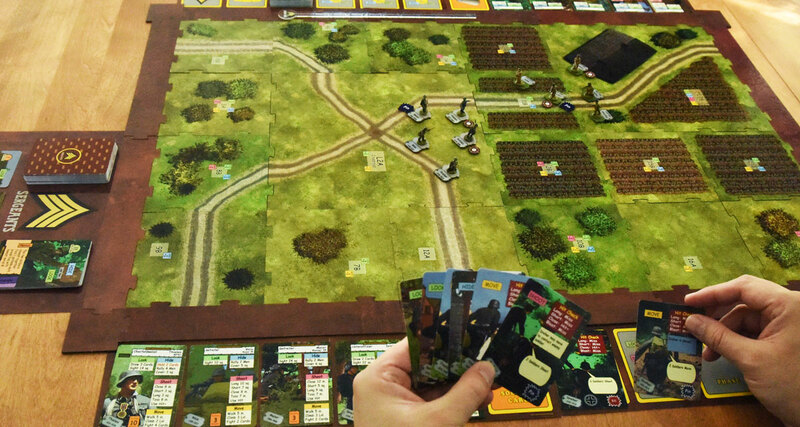 Allows a player to sight enemy soldiers, draws additional cards or even spot specific portions of the map. Allows your solider to take cover and hide from enemy view, rally himself or comrades. You can also have the soldier tuck a card away for later use! 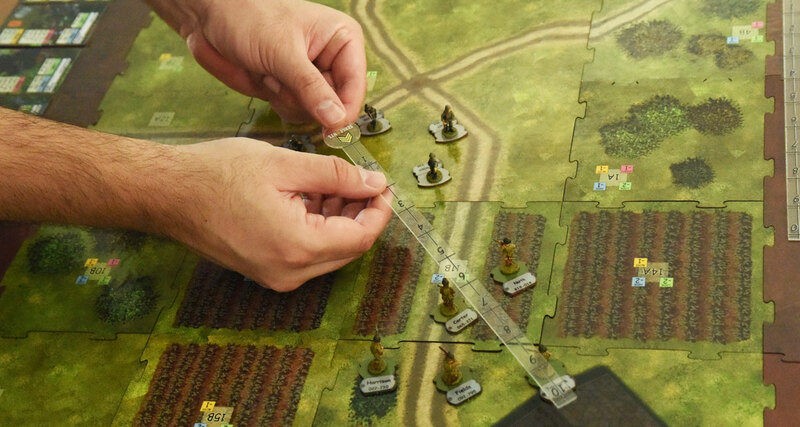 Allows soldiers to move across the battlefield that is measured in inches according to the soldiers Walk value. 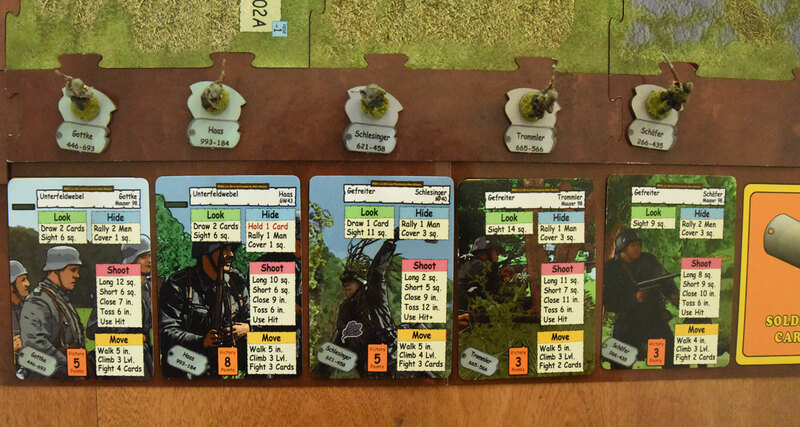 Can also be used to determine the soldiers Climb ability when ascending and descending 3-D terrain. Allows soldiers to fire their respective weapon, toss grenades or satchel charges. 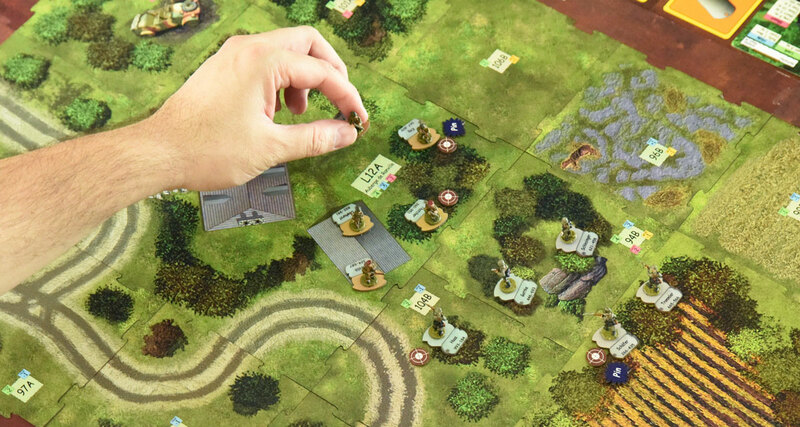 Sergeants Miniatures Game Starter Sets include everything to play right out of the box. On the night of June 6th, 1944 two US Airborne divisions dropped into Normandy. The operation was well planned but a night drop while under heavy fire from the German flak cannons made it a disaster. Very few soldiers made it to their landing zones. Many were far off target and landed in flooded areas, woods or even in the ocean. The most formidable assault force of its time became scattered across France on the night winds. 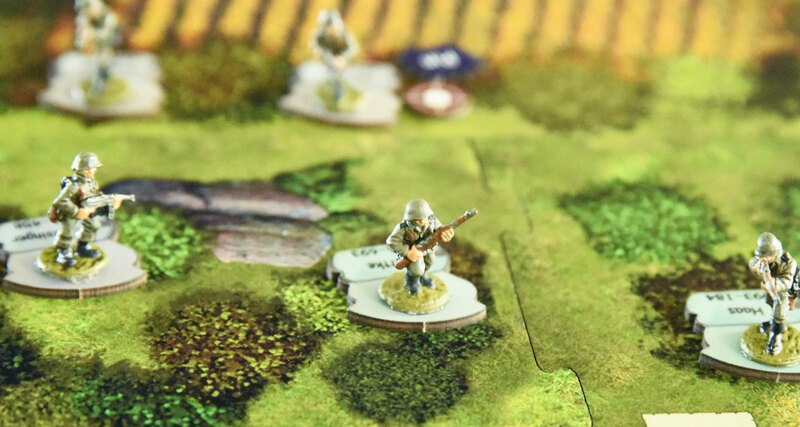 In Sergeants Day of Days, you take on the role of a squad leader and command either the US Airborne infantry or the German Wehrmacht defense forces during the early D-Day invasion. 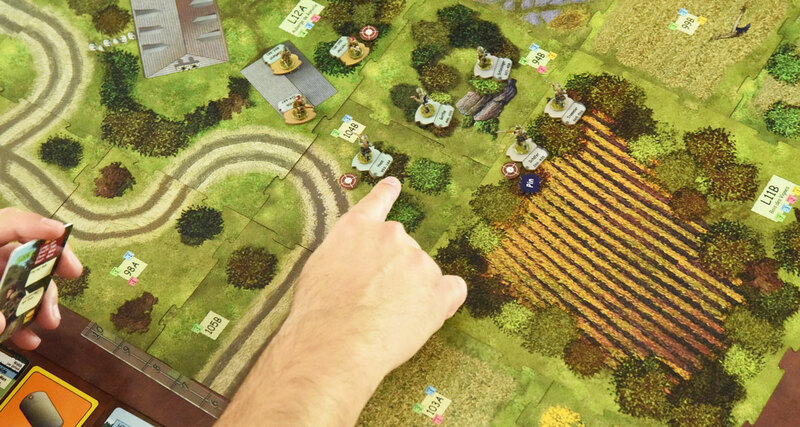 Featuring hand-painted miniatures, Sergeants Miniatures Game recreates exciting World War II battles from small squad skirmish engagements to platoon level conflicts. 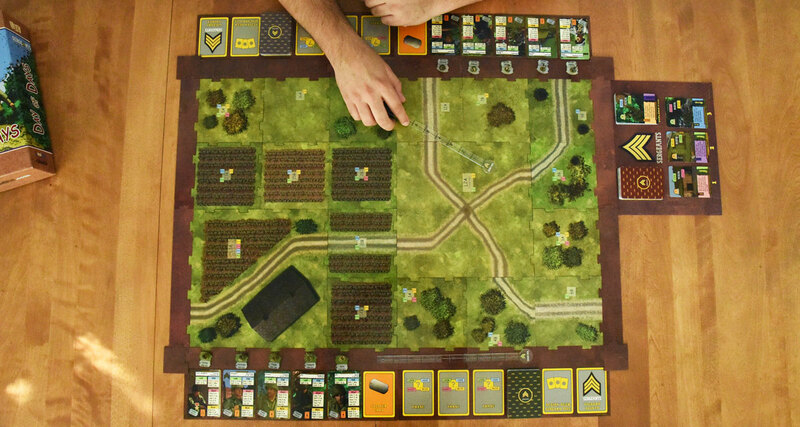 Select and equip your soldiers, pick up your orders, plan your avenue of attack, and complete your mission. The British 6th Airborne Division had extensively trained in bridge and fortification capture. The soldiers each had a spirit of self-discipline, self-reliance, aggressiveness coupled with an emphasis given to physical fitness, marksmanship, and fieldcraft. Operation Tonga dropped three Parachute Brigades to clear fortifications and destroy or capture critical bridges. Supported by a brigade of glider-borne troops, they were some of the most heavily armed soldiers fielded by the British Army. 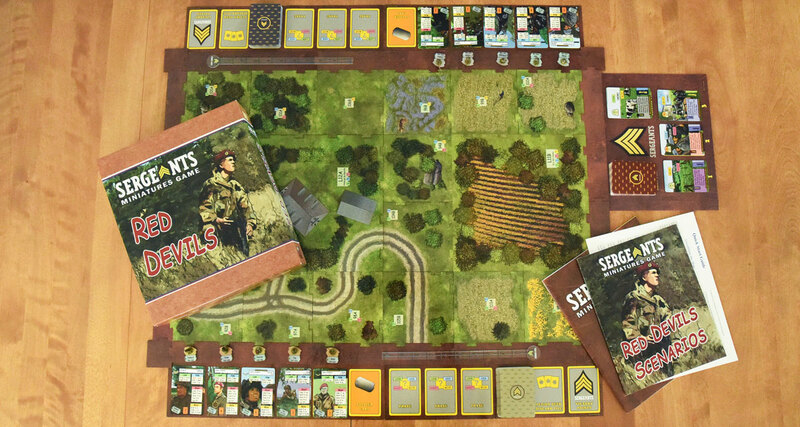 In Sergeants Red Devils, you take on the role of a squad leader and command either the British Airborne infantry or the German Wehrmacht defense forces during the early D-Day invasion.